John Smith is a retired high school English teacher whose work has appeared in NJ Audubon since the 1980s and in numerous other literary magazines and anthologies. His poem, "Lived Like a Saint,” was set to music by Philadelphia composer Tina Davidson, as part of a choral work, "Listening to the Earth,” commissioned by the New Jersey Parks Commission. Another poem, "Birding,” was commissioned by New Jersey Audubon for their centennial. 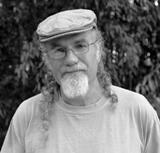 In addition to poetry, John enjoys writing, cooking, gardening, and keeping an eye on the birds. "The avalanche / of sunlight" - just one of the lovely expressions in this fine poem. If children did that today, would their parents be arrested for child endangerment? It sounds like a marvelous way for a young person to live in the world. I climbed water - wonderful. Shad? Super poem. Loved it. The shad is a fish that swims up the Delaware at a certain time of year. What a fine poem, its skinny lines outlining the swimmer's body. "Shad" is also an urban term for "bravery," I think. Enlighten us, John. Tremendously evocative! (enough to make me homesick--for my own earlier years, for Jersey, for the adults who used to rave about shad roe--and for Jersey itself). The NJ Parks Commission and Audubon have chosen well indeed! Beautiful descriptive poem, but what is shad? As in shad of it?